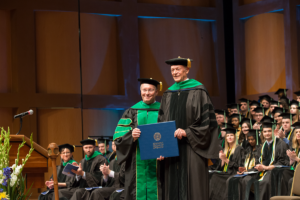 Ellis Potter, OD ’67, FAAO, was chosen to receive Southern College of Optometry’s Doctor of Ocular Science degree and deliver the commencement address to the Class of 2018 at this year’s commencement address. 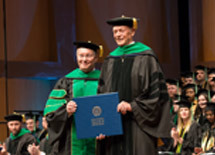 Known for his longtime service to VOSH International and other international causes, Dr. Potter was recognized by the American Academy of Optometry in 2017 with its Brien Holden Humanitarian Award. In private practice in Iola, Kansas, Dr. Potter has served on numerous committees as well as Editor of the Kansas Optometric Journal. Active in his local Rotary Club, he is a member of the Rotary Action Group for Avoidable Blindness. In 2008, Dr. Potter and his local Rotarians formed the Vision Quest International Foundation, whose purpose is the education and alleviation of Refractive Error Blindness. He has led the organization as president. A member of VOSH-Kansas and a Fellow of VOSH International, Dr. Potter has led or participated in numerous VOSH medical missions. He was awarded the VOSH/International Dr. Harry I. Zelter Lifetime Achievement Award at the VOSH/International annual meeting in Chicago in October 2017.